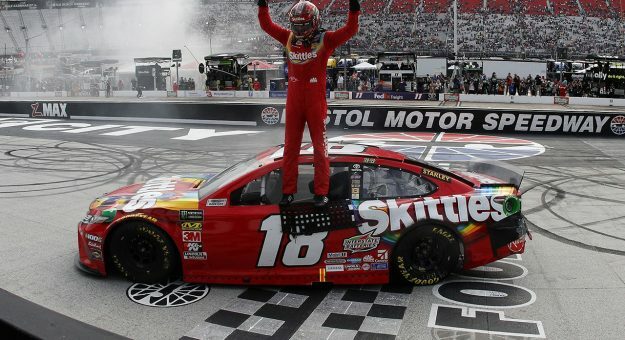 Kyle Busch won Sunday’s Food City 500 for his eighth win at Bristol Motor Speedway in the Monster Energy NASCAR Cup Series. Busch was part of the day’s first caution flag when he got tangled up in an accident. But he was able to recover and charge back to hold off his brother Kurt to score his third win of the season. A decision to not pit late for tires after a caution flew gave Busch the lead and from there he raced his way back to Victory Lane. Busch led three times for 71 laps including the final 19. Kurt Busch, Joey Logano, Ryan Blaney and Denny Hamlin rounded out the top five. Paul Menard, Clint Bowyer, Daniel Suarez, Ryan Newman and Jimmie Johnson completed the first 10 finishers. The Monster Energy NASCAR Cup Series now heads to Richmond Raceway next Saturday night. How Busch Won: A late caution brought some of the leaders to pit road for tires but Busch was one of four to stay out. On the final restart he was able to get the jump on his brother Kurt and once he got by pulled away to a comfortable advantage and took checkered flag number three of the season. Who Had a Good Day: Kurt Busch had his best finish of the season and has finished in the top 10 in six of the last seven races this season (Read More)…Logano has finished in the top 10 in seven of the last eight Bristol races…Blaney led 158 laps, his most ever in a race…Menard had his first top-10 finish since Talladega last fall. Who Had a Bad Day: Kevin Harvick’s day was in trouble before the race started when he failed pre-race inspection three times. In addition to losing engineer Billy Kuebler who was ejected, Harvick started the race last and had a pass-through penalty. At one point he was four laps down, but did recover to finish 13th…Aric Almirola was an early casualty when he was part of a crash that saw Ricky Stenhouse Jr. slam into the back of Kyle Busch’s car to set off a melee…Chase Elliott started from the pole but spun out after contact from behind near the end of the second stage. Elliott lost power steering but was still able to wrestle his car back into the top 10 before hitting the wall late…Martin Truex Jr. was battling for the lead but a loose wheel and then a pit road penalty ruined his day…Kyle Larson had two straight Bristol second-place finishes coming into the race but his miserable day got worse with less than 90 laps to go when he made contact with a slower car and then tangled with William Byron…Denny Hamlin had the lead late after a two tire pit stop but was penalized for speeding on pit road…Clint Bowyer was in the battle for the lead but he cut tire and slammed the wall in the late going…Chris Buescher was in the top five with less than 50 laps to go but had a right side tire issue and was forced to pit…Brad Keselowski was black flagged before what was the final restart for “not following directive” and taking his spot in the lineup (Read More). What Else Happened: It was a wild day reminiscent of some of Bristol’s heyday races of the past. There were a number of twists and turns because of mistakes on pit road, loose wheels and other miscues. But the on track action triggered more than a few damaged race cars when the tightly packed groups checked up for trouble ahead and the accordion effect happened. Quotable: “That was fun. We got a long way to go, but proud of that,” Ty Dillon after edging Clint Bowyer to win the first stage. Notables: This is only the second time the Busch brothers have finished 1-2 in a Cup race – the last at Sonoma in 2015…Kyle Busch has won three of the last four races at Bristol…Toyota has won five of the year’s eight races…Busch’s 54th career win ties him with Lee Petty on the all-time list.